Yaneera is the youngest Empress in the history of Andara. With her land in turmoil, she must use her wit and cunning just to stay alive. Severe drought has brought with it famine, starvation, and death. As her people waver on the verge of open rebellion, Yaneera must deliver them or perish at their hand. Andara’s struggles have not gone unnoticed. Neighboring kingdoms stand ready to deliver the killing blow. As chaos erupts across the land a stranger appears in the Empress’ court. Preaching the presence of a new God, Mythos, the newcomer promises deliverance for Yaneera and her people. Mythos power is not without a price, and Yaneera soon finds herself facing a crisis of conscience. . .
Will she sell her soul to save her people? 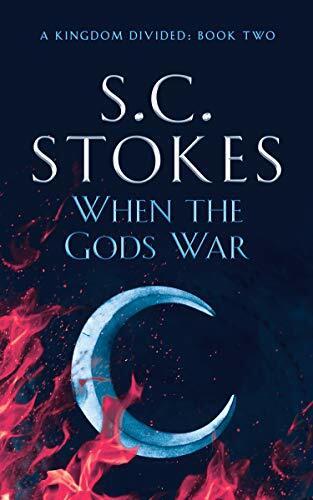 If you enjoy action-packed adventure and frantic fantasy you will love S.C. Stokes’ When The Gods War. Grab your copy and enter this exciting new world today. When the Gods War is the exciting sequel to A Coronation of Kings. It can be read as a stand-alone novel or as book two in the Chronicles of Meldinar Series. When I started reading When The Gods War, I was a little confused but a little intrigued. What confused me was that the author chose not to include the characters from the first book until about halfway through. Instead, he built up the nations and people of the Sevalorn, who were briefly mentioned in the first book. I am actually glad that he did that because there was so much backstory to the nation of Andara, The Plains of Kairon, the kingdoms of Vitaem, Tres Cidea, and Khashish, the forests of Diadri and the Dwarven Kingdom of the Everpeak. The confusion was because that was a move that I didn’t expect. Honestly, I thought that we would be seeing Syrion, Tristan, and Elaina sooner in the book…not later. What I also liked was that there were no really bad guys. Yaneera did have a hand in all the drama and war that was started but, in her defense, she did it because she was backed into a corner by Vitaem and she would have done anything to save her people. Even if that meant aligning herself with a newcomer who promises her that he will save her. Just reading Yaneera’s thoughts and how she really didn’t like Jonas but needed him was fascinating. It made for a great read and made me alternately feel bad for her and not like her. The end of the book was very anticlimactic and it ended suddenly. But, with the way it ended, I could see a book 3. The reason I say that is because there were certain storylines there was not wrapped up and I need to know what is going to happen. Why: Like the first book, this book was very engrossing. It was also very fast paced and the characters were 3D.